Learning to sail was a pivotal experience for me. At the age of 14 I transitioned to the role of instructor. I spent summers away from my South Carolina home by instructing in various capacities up and down the East Coast. After my sophomore year at Clemson University I moved to East Hampton to teach sailing at the Devon Yacht Club in Amagansett, NY. In 2010 I finished at Clemson with a degree in Community Sport, Recreation and Camp Management, and a minor in Business Administration. I then earned my captain's license and dove head first into a professional sailing career. The first boat I joined was the 137' historic Roseway Schooner. I worked my way from deckhand to first mate in a matter of months, quickly realizing the sea was for me. 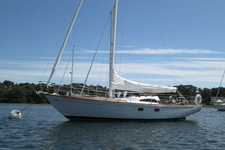 Following the Roseway I spent 3 years serving as first mate aboard Far Bay, a 72' private sailing yacht. These jobs afforded me a wealth of hands on experience in offshore sailing as well as boat maintenance. Come join me aboard my sailboat! The time spent on the water with Captain Martin was great!! It was a beautiful day, a pretty good breeze and lots of laughs! He has a lovely sailboat and, it goes without saying, that he is a wonderful captain!! We sailed from East Hampton and during our trip he gave us details about points of interest. Sail with Captain Martin! It's a wonderful experience: one you'll always remember!